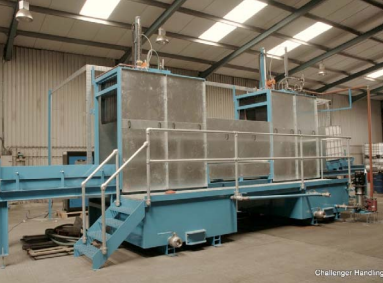 The Challenger automatic IBC wash system is designed to Wash, drain and rinse used IBC containers both internally and externally for re-use. Our walking beam type conveying system ensures precise container alignment at all of the treatment stations The system is built up from modular sections which can be easily expanded to incorporate additional equipment in the future. Module 1: An inclined in-feed twin line gravity roller conveyor fitted with a ‘pocket stop’ to locate the IBC. A drain tray with socket connection is fitted below. The IBC containers will be then be automatically picked up via our walking beam type conveyor from the ‘pocket stop’ situated within the following washing area. Module 2: A first stage hot caustic internal wash incorporating a tank of approximately 2,000 litres water capacity. The tank is fitted with a mud door for cleaning purposes and can be heated by means of electric or steam immersion heaters. The stainless steel cleaning head mounted on a gantry above the tank rotates in a cyclic operating mode that ensures full coverage of the inside of the container through its four wash jets. A bypass line piped to jets to spray over the top of the IBC is included for external washing purposes. A centrifugal pump circulates the heated wash detergent via a twin cartridge filter that allows cleaning during operation of the plant without interrupting production. Module 3: A drain station with drain tray allows emptying of the contents back to module 2. Module 4: A second stage cold high-pressure internal wash from the fresh mains supply mounted above tank of approximately 2,000 litres water capacity. A high-pressure cabinet type pressure washer fed from your cold mains supply feeds through a pneumatically operated valve to the cleaning head that is mounted on a gantry above the tank. The motor powered stainless steel cleaning head rotates in a cyclic operating mode that ensures full coverage of the inside of the container. The high pressure washer is an 8 hour duty cabinet type with facility for hot operation from its integral oil burner. 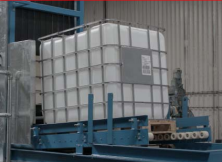 An array of jets mounted above the IBC station and connected to your fresh mains supply to rinse the outside of the container is included. 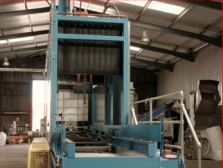 Module 5: A final horizontal discharge section is designed to allow the last IBC to be automatically discharged on to your conveyor system or manually unloaded by the operative to your further treatment stations. A drain channel is included back to the tank in module 4 above. Control system: An overall adjustable cyclic timer is mounted on the front of the cabinet and individual adjustable timers for each of the wash processes mounted within it. All modular sections detailed above and are operated by a PLC control system. This control system will include safety interlocks to inhibit flow if no container is in place or in the event of the wash head not aligning correctly and has interlocks to ensure operator safety.